The blistering chill of the winter landscape leaves many rushing into the warm indoors, often to a cozy nook beside the fireplace. Memories made around fireplaces can stir the soul. Most importantly, safety precautions should be at the forefront of homeowners’ minds when using the fireplace. 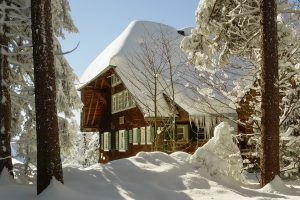 According to the National Fire Protection Association (NFPA), 31 percent of home fires between 2011 and 2015 were caused by fireplaces and chimneys, resulting in an estimated 262 million dollars in direct property damage each year. Dancing with fire requires adequate knowledge of fire safety tips. Families gather around the fireplace’s dancing flames to enjoy a brief spell of warmth. Be sure to keep this time in front of the fire short. Fireplaces are not meant to serve as long-term sources of warmth, such as furnaces. Rather, run the fireplace up to five hours, max. Jumping flames should be contained. Restrict sparks from the fireplace by closing the mesh screen. Shutting the screen ensures minor sparks will not bounce onto the carpeting or hearth and cause damage. Further protect the carpeting around the fireplace by purchasing fireplace accessories. A non-flammable rug should be placed around the fireplace to catch sparks. The rug dually serves to protect the home’s carpeting and prevent it from melting. Non-flammable rugs can be purchased from stores that sell fireplace supplies. Where there is fire, there is smoke. If the fireplace emits uncomfortable amounts of smoke and if weather permits, open a single window for a short time. The breeze will clear the room of smoke and then travel up the chimney. When handling the burning wood nestled inside the fireplace, use tools—not your bare hands. Specialized fireplace tools are available specifically for managing burning logs. Cured and dry wood burns well in fireplaces. Never burn wet wood. Wood that has been dried for at least six months is deemed dry firewood. Also, while building a stash of firewood, be sure to burn only seasoned firewood. Toxic chemicals are released when materials like construction scraps, plastic, rubber, boxes or painted wood are burned in the fireplace. Plus, carbon monoxide emissions are greatly reduced when burning seasoned wood. 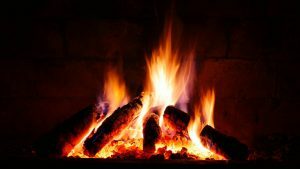 According to the Environmental Protection Agency, manufactured wood may be used in the fireplace, but only if it consists of 100 percent compressed sawdust. Forest pests can hitch a ride in firewood. Avoid transporting these critters into your property by burning only locally cut firewood. Pesky animals often build nests around the chimney flue. A chimney cap will ward off the unwanted critters. A chimney cap also prevents debris from blocking the chimney. 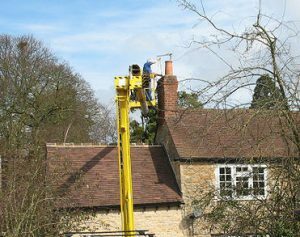 (A blocked chimney can cause carbon monoxide to build up in the home.) Snow and rain have little opportunity to leak into the chimney when a chimney cap is in place. Downdrafts are also reduced. Fireplace smoke has an unrestricted path to rush out of the chimney through the chimney cap’s vents. When choosing a chimney cap, opt for stainless steel, since it will not rust (like a galvanized metal cap will). When the fireplace is not in use, close the damper. By taking this step, the surges of warm air from a heated home are prevented from shooting up and out of the chimney. When closing the damper, make sure it has a tight seal. Wasted heat is a result of a poorly sealed damper. Fireplaces release carbon monoxide, whether the fireplace burns wood or is fueled by gas. A properly installed chimney ensures carbon monoxide has an upward airflow and is expelled outside of the home. Regardless of how well a fireplace is installed, carbon monoxide detectors placed around the bedrooms and the fireplace are critical. Along with installing sensors, test the units periodically. A fireplace should be inspected and cleaned annually. Hire a certified chimney sweep to perform the cleaning prior to winter to remove lingering soot and debris. If the fireplace is used often, schedule the fireplace cleaning after approximately every 80 fires. A chimney sweep inspection includes looking for cracks, wobbly bricks or mortar loss from the chimney’s exterior structure. Professional chimney sweeps should notify the homeowner upon finding any signs of deterioration during the inspection and take steps to fix the issues. Overloading the fireplace with excessive heat or expansive flames can prompt cracks in the chimney. Less smoke is released when burning smaller fires; consequently, creosote buildup is reduced. The EPA recommends utilizing dry kindling, as opposed to using flammable liquids to start a fire. Liquids the agency advises against using are gasoline, a charcoal starter and kerosene. The EPA also suggests installing natural gas or a propane log lighter in the fireplace. Coals in the fireplace can remain hot and flammable for up to three days. After igniting the fireplace, wait at least three days before cleaning up the ashes. Leave about an inch of ash in the firebox to serve as insulation and prompt the coals to heat quicker the next time the fireplace is lit. Practicing fireplace safety will prevent an unanticipated outbreak of fire. Of all the types of fires, wood and paper fires are most common when fireplaces are ignited. 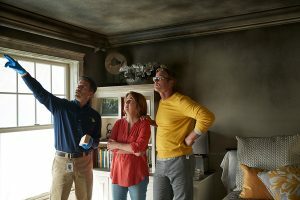 When your home is affected by a fire, consult a trusted fire and smoke damage restoration service to return your property to its pre-disaster condition. ServiceMaster DAK is prepared to tackle any level of fire and smoke damage. Soot and smoke damage spread uncontrollably unless these aftereffects of the fire are contained by professionals. ServiceMaster DAK technicians thoroughly clean soot from materials like aluminum, brass, porcelain, marble and tile. Emergency pre-cleaning, content cleaning, wall and ceiling cleaning and deodorization are among the comprehensive services provided by the established company. 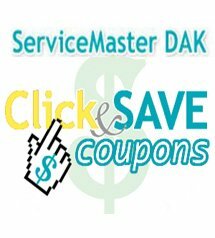 ServiceMaster DAK reliably serves Chicagoland’s Northshore and Northwest suburban communities of businesses and residential homes. Our fire and smoke damage restoration technicians are standing by 24 hours a day, 365 days a year to take emergency calls.